Additional Info: PJ Rohr, flutist and harpist, is active as a chamber musician with numerous instrumental and vocal collaborations, performing classical, early and celtic music. She has been a private instructor for 30 years, adjunct professor of flute at Clearwater Christian College, masterclass teacher--including running her own masterclass, the Summer Flute Academy. She has performed with many orchestras, including the Atlanta Ballet Orchestra, The Florida Orchestra, and the Boulder Philharmonic. 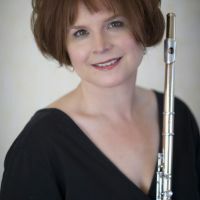 She is a past winner of both the Music Teacher’s National Association Collegiate-Artist Competition and the National Flute Association Convention Performer’s Competition, a grant recipient from the Pinellas County Arts Council, has premiered works written for her internationally, and has performed at several national and state flute conventions. She has recorded two CDs, “Dreams, Diversions and Digressions, 20th century music for a flute and cello” and “About Foreign Lands and People” with flute and harp, on the Chaminade label, as a guest on a rock-n-roll CD and on a Gilbert & Sullivan operetta. Her teachers include Wissam Boustany [former principal flute Chamber Orchestra of Europe] and Peter Lloyd [former principal flute London Symphony Orchestra] in England.